AnglerFish Handmade Lampwork is now for sale on this site! We’ll update our gallery page (scroll to bottom of gallery to see lampwork) with new beads, and bead sets at the start of every month. Check it out! USB Lampwork Display System is now available. 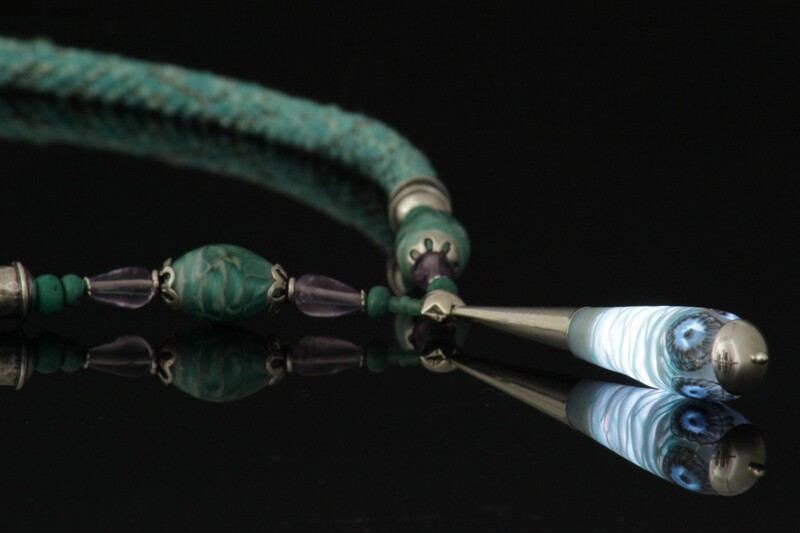 For the past two years AnglerFish Jewelry has been selling our own hand-made lampwork at bead shows and in finished jewelry. We’ve worked hard to invent new ways of displaying our translucent lampwork, and our new display units are available for purchase! Sat, Apr 6, 2019 @ Oaks, PA. Leather & Lights Necklace: LED-Illuminated Focal Beads with Woven Leather Cords at Spring IBExpo, 3 hrs 10am-1pm. Promotional video. Registration is now open! Sat, June 8, 2019 @ Milwaukee, WI. Leather & Lights LED-Illuminated Necklace at Bead & Button, 3 hrs 6-9pm, B191222. Browsing is now open; registration begins Jan 8. NEW! Mar 23. Cabin Fever Indie Market, Cambridge, MA. Apr 5-7. Innovative Bead Expo, Oaks, PA.
Apr 13. New England Chapter, International Society of Glass Beadmakers Annual Sale, Marlboro, MA. NEW! Apr 28. Long Island Bead Festival, Hauppauge, NY. May 10-11. Innovative Bead Expo, Marlboro, MA. Jun 6-9. Bead & Button, Milwaukee, WI. Jul 27-28. Innovative Bead Expo, Concord, NH. Aug 16-18. BeadFest, Oaks, PA.
Sept 7. CT Bead Society’s Bead Bazaar. Middletown, CT.
Oct 18-20. Whole Bead Show, NYC. Nov 16-17. Hartford Artisans Showcase, Hartford, CT. Finished jewelry, DIY kits and individual components available. 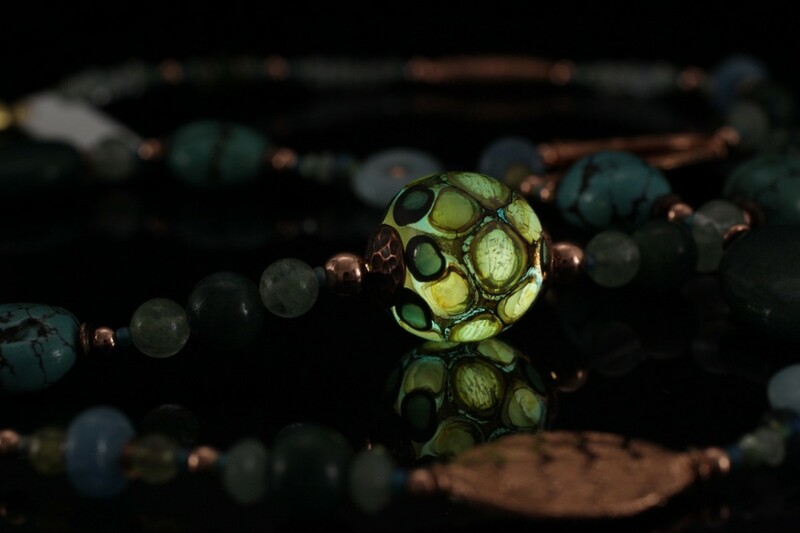 A single LED illuminates the focal bead in each necklace. 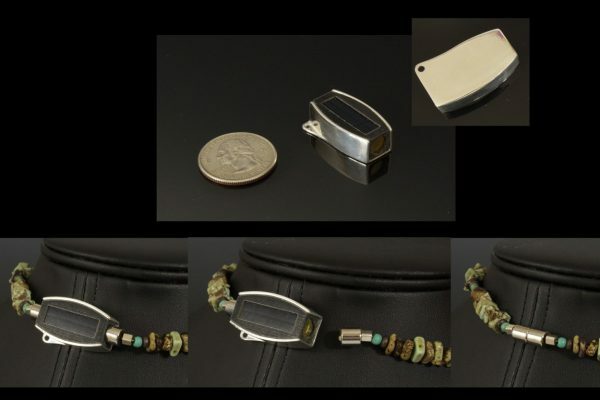 Solar or USB rechargeable battery pack (“power clasp”) mounts between a magnetic necklace clasp to provide power. (No batteries to change!). 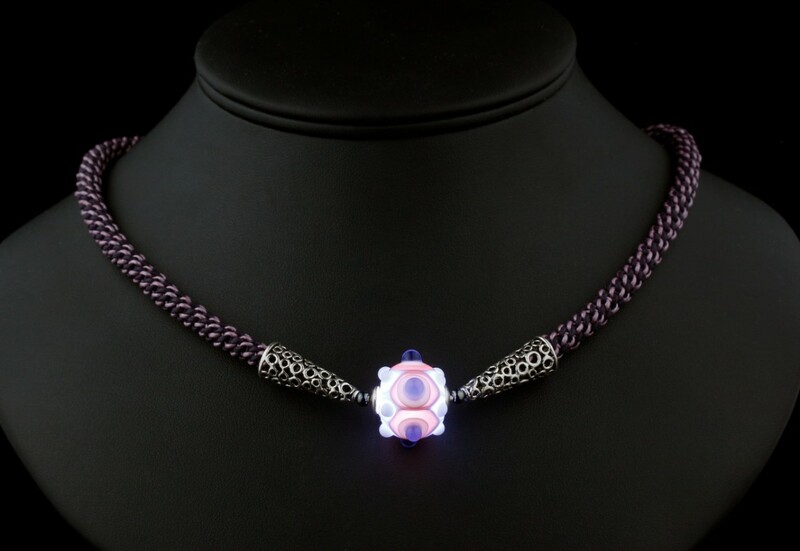 One power clasp can illuminate necklaces interchangeably. Created by jewelry designers for jewelry designers, our DIY assembly uses tools and methods familiar to beaders, like screw crimps, tube crimps and multi-strand stringing wire.